BETHLEHEM (Ma’an) — In what appeared to be a coordinated effort, Fatah youth activists on Friday tore down signs promoting a one-state solution to the Israeli-Palestinian conflict. In Ramallah, Nablus and Qalqiliya images on Facebook showed the youths removing large billboard-sized signs promoting “one democratic state” as an alternative to the Western-backed “two-state solution” supported by Fatah and the Palestinian Authority. 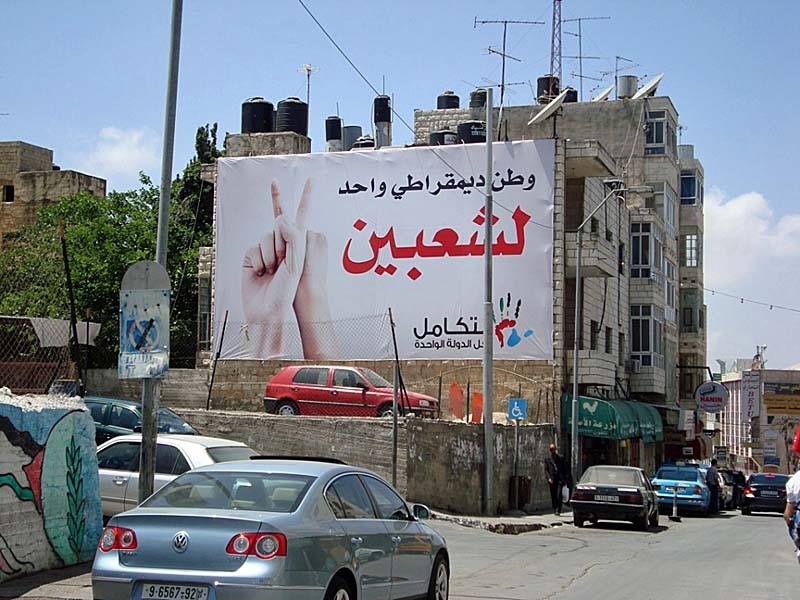 The posters were placed in cities in the occupied West Bank by a group called Takamul, but not much is known about its politics or backers. On some posters, the text called for a single democratic state for Arabs and Jews. The text referenced “six million Jews and 5 million Arabs,” which sparked discussion of the group’s motives and whether or not the reference ignored Palestinian refugees. In Nablus, activists defaced the posters with Fatah slogans. Images and video of the effort to remove the posters, which appeared coordinated, were posted on Facebook and YouTube.